The Nelles Manor is a government of Canada registered Charitable organization. The Manor is run by volunteers, and costs are kept in check as much as possible. However, the manor is 225 years old, and requires significant amounts of upkeep. Programs require funding. The foundation has been set up to fund the house and its operations, but additional funds are required for the continued and ongoing operation of this house. As a Provincially registered Non-profit, we are audited yearly, and follow strict guidelines on the care and use of our funds. All funds raised are used directly in the upkeep, maintenance of the Nelles Heritage House, or to fund ongoing operations. Ticket sales for admission and tours are an important part of the funding of the ongoing operations of the Manor. This gives the Manor an important source of ongoing funds, but also gives our staff an idea on demand for the services we offer to the public. The Nelles Manor can be rented in parts. The grounds can be rented for outdoor events. Parts of the Manor itself can be rented for events such as weddings or meetings. The Nelles Manor offers a number of corporate and personal sponsorship opportunities. Most of these opportunities are offered for special events. The Nelles Manor Heritage House offers yearly membership to the public in general. These memberships are a very important part of our funding, but also allow us to feel supported by the community. Donations to the Nelles Manor Heritage House are always welcome. See our donations page to find out how you can donate to the Manor. This season, we are holding a special Fundraising Campaign. It has been 200 years since the completion of Nelles Manor by Col. Robert Nelles in 1798. 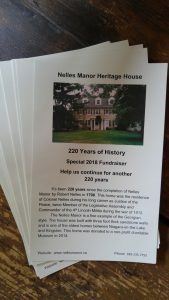 Our goal is to raise $100 for each of the 220 years to commemorate this anniversary, and to help ensure we have the funds to preserve, protect, and present this historic home. So far, a total of 104 years have been purchased! If you would like to purchase a year, please give us a call or send us an email. We are deeply touched by the generosity of all those who have given to the campaign thus far.